Luke’s account of the conversion of Saul and his subsequent time in Damascus records the nighttime escape from the city. A modern chapel built into the old city wall marks a spot where this might have happened. Tradition calls it St. Paul’s Window. St. Paul’s Window in Damascus. Photo by Ferrell Jenkins. In 2 Corinthians, Paul provides historical context for this event. Paul says that the governor (literally ethnarch) under Aretas the king was guarding the city. Aretas IV was a Nabatean ruler whose jurisdiction, in some way, extended to Damascus. The king, whose rule extended from 9 B.C. to A.D. 40, was father-in-law to Herod Antipas. This chronological note lets us know that Saul’s conversion was prior to A.D. 40. Sometimes one gets lucky when visiting certain sites or museums. My last visit to the Vatican Museum in Rome provided a nice surprise. 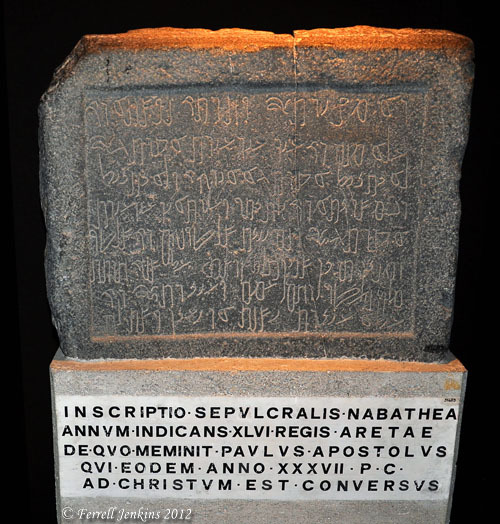 A Nabatean tomb inscription mentioning Aretas was on display in a special exhibit. Nabatean inscription mentioning King Aretas. Vatican Museum. Photo: Ferrell Jenkins. NABATEAN SEPULCHRAL INSCRIPTION REFERRING TO THE 46th YEAR OF THE KING ARETAS (37 AD), WHO IS QUOTED BY THE APOSTLE PAUL (WHO CONVERTED AROUND THIS TIME). For those who may have forgotten, the Nabateans were responsible for the beautiful temples and tombs we see when we visit Petra. 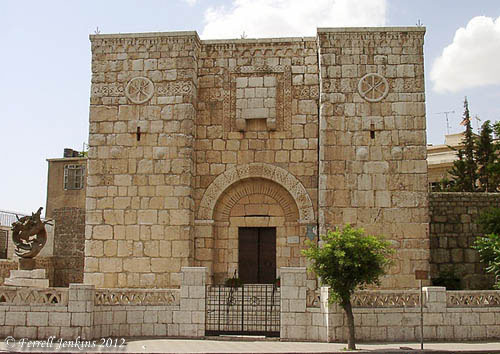 This entry was posted in Archaeology, Bible Places, Bible Study, Jordan, New Testament, Photography, Travel and tagged Apostle Paul, Book of Acts. Bookmark the permalink.